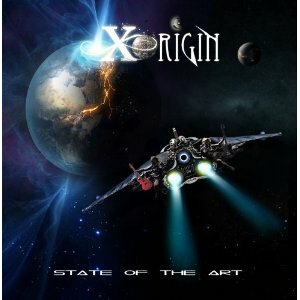 Xorigin are a new signing to Frontiers with ‘State Of The Art’ representing the debut release from this new band based around two musicians with a history dating back to 1999. Vocalist Johannes Stole (P.O.B.) and guitarist Daniel Palmqvist (solo/ex The Murder Of My Sweet) first met when students at Musicians Institute in Los Angeles where they formed the band Orange Crush. The time over on American shores for these Scandinavians was obviously well spent with the influence of the likes of Toto, Giant and Foreigner etc run high throughout the sound of this 11 track debut. Stylistically this is right what you’d expect for Frontiers i.e. melodic vocals, big hooks, lots of keyboards and a keen commercial edge with a production by Daniel Flores (The Murder Of My Sweet / Mind’s Eye) who also plays drums on the album. Opener “Can’t Keep Running” is an infectious track, very eighties in outlook and sound with its synth bass sound and big chorus hook which sees well layered vocal melodies it’s a strong opening number. Yet sadly is the first indicator of a production flaw that runs throughout the album, namely Daniel Palmqvist’s guitar solos being mixed too low for my tastes, a shame as Palmqvist is no slouch on the guitar. However, back to the music and the album continues along a path of solidly constructed numbers with the mid- tempo waters of “Crying For You”, “The One For Me” (which I thought was going to break into the ‘1987’ version of Whitesnake’s ‘ Here I Go Again’ at the intro) and “What Love Is All About” being tracks that are easy on the ear with their pleasing melodies and enjoyable instrumentation. Elsewhere “Gina” (not a Michael Bolton cover) has traces of ‘Big Generator’ era Yes which works well, “This Is It” is a little darker than much of the material for the verses but hits a vibrant stride with its chorus, whilst “Said And Done” offers up a more straight rock feel. Big power ballad fans are well catered for with “In The Blink Of An Eye” sounding like the perfect companion to the likes of Winger’s ‘Miles Away’ or Damn Yankees ‘High Enough’. Good stuff just 20 years too late but hey nothing wrong with nostalgia when it’s well crafted like this. The album closes with a slightly more contemporary and modern sounding ballad in “Mend My Heart” and it’s a nice way to see the album out. At a hair under 48 minutes this is about the perfect length for anyone wanting to revel in some melodic rock that for the most part if high in quality with good performances to boot. The slight flaw in the mix is a little disappointing but otherwise this is a good release and one that will hopefully pave the way for future works from Palmqvist and Stole. This entry was posted in Reviews and tagged Daniel Palmqvist, Frontiers Records, Johannes Stole, review, State Of The Art, Xorigin. Bookmark the permalink. 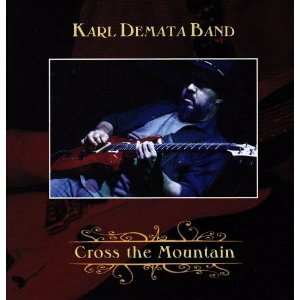 An Italian native but after a period of travelling now a UK resident, Karl Demata steps up to the plate to release his debut album of blues powered rock. Inspired by the late sixties British and American blues rock scene Karl has a playing palette that covers numerous genres yet its his love of the blues that if featured here. With a style not a million miles away from vintage sounds ala Cream and the Allman Brothers, “Cross The Mountain” is a power trio offering which at times also has hints of Joe Bonamassa’s earlier work and from a heavier side of things the Stoney Curtis Band. With some tasty guitar work and pleasing songs this is an enjoyable listen, nothing groundbreaking but Karl’s guitar work will you’re your interest throughout the 11 tracks. Also for blues fans out there the album features guest performances from percussionist Hugh Flint (from John Mayall Bluesbreakers ‘Beano’ fame). Highlights to these ears come in the guise of the laid back “Until The End” with its moody slide parts, the upbeat groove of “Looking Through You” and the mid-tempo waters of “Failing Design” which its Bonamassa style groove and creamy lead lines creates an intoxicating sound. On the downside the production is rather basic and lacks some excitement in the final mix but as this is self financed its more than acceptable and still perfectly listenable. Also Karl’s vocals don’t always sit well with some of the material, on the moodier numbers they work well and have an almost Bob Dylan meets Johnny Winter drawl to them which is likeable enough, but for the most part Karl does tend to stay within a comfort zone m which does come across as a little monotonous after a while. That said this is a pleasant enough debut release and worth a check out for blues rock fans out there. This entry was posted in Reviews and tagged Allman Brothers Band, Bob Dylan, Cross The Mountain, Joe Bonamassa, Johnny Winter, Karl Demata, review. Bookmark the permalink.